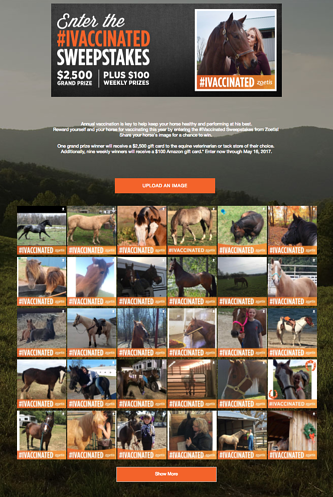 Know your audience: For an incentive, Zoetis is giving away $100 Amazon gift cards over the course of nine weeks — and one grand prize gift card of $2,500 to the equine veterinarian or tack store of the winner’s choice. Offering a prize in line with both the requested content and the target audience further established Zoetis’ credibility. Count on users’ passion: Horse people love their horses, which is obvious from the UGC gallery. Adorable foals jumping for joy, riders going for a difficult jump, owners proudly leading their horses — all are pictured, showcasing how fully the four-legged friends are incorporated into users’ lives. To capitalize on this enthusiasm, the brand also offered relevant stickers, like horseshoes, cowboy hats and blue ribbons. Not every product immediately generates an obvious UGC campaign. However, creative brands like Zoetis can capitalize on the passion and enthusiasm of their user base.